A loyalty card scheme launched in Hailsham to give customers a greater incentive to use town centre shops now has the 2019 Hailsham Card available to purchase at the Town Council offices in Market Street. The Hailsham Card scheme, which is funded by the Hailsham Forward town team and fully supported by the Town Council and local Chamber of Commerce, offers exclusive discounts and offers to cardholders on independent businesses throughout the town centre. Membership of the 2019 Hailsham Card (valid until 31st December 2019) costs just £10 and cardholders can use the card to receive unlimited local discounts in all the local businesses that are part of the scheme (including any online businesses) together with any other towns across Sussex that are signed up to the scheme, including Eastbourne, Hastings and Bexhill. There are no points to collect, no paperwork and no vouchers to print out. Members can benefit from a free app and website profiling each business and their discount. 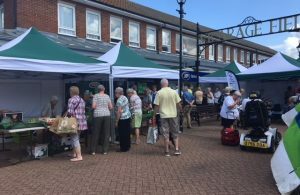 Hailsham Forward, which provided £1,000 for start-up costs and promotion of the scheme, is encouraging more local businesses to participate in and create revenue from the scheme. A ‘Buy Local’ solution is being endorsed by Hailsham Forward to help create revenue for the businesses participating in the scheme through membership sales and new membership. “It’s so important that people shop local and we hope residents and visitors to the town will continue to take advantage of the loyalty card scheme,” said Deputy Town Clerk and Business Enterprise Manager Mickey Caira. More information on the Hailsham Loyalty Card Scheme and details about registering can be found at www.towncitycards.com/hailsham/.